Blue pitbulls and blue nose pitbulls have become so popular recently that breeders and fanciers have coined the term "blue lust" to describe the public's demand for dogs of this color. That, by itself, should give you a hint about the dynamics behind the popularity of these dogs. A few years ago, red nose pit bulls were all the rage and are still fairly popular today. No doubt, a few years from now, some other coat color or physical attribute will take center stage and become the "flavor du jour". While these dogs may be striking to look at, there are drawbacks to selecting a pit bull based primarily on appearance. So, before you throw down big bucks for that "rare blue nose pitbull", take a few moments to read through this article and educate yourself on the facts. A blue pitbull is quite simply one with a "blue" coat which can range anywhere from a light silvery gray to deep charcoal. Likewise, blue nose pitbulls have grayish nose leather rather than the more common black nose. 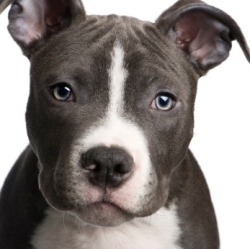 Blue pitbulls ARE NOT a separate breed or a distinct bloodline of the APBT. What causes the blue-gray coloration may actually surprise you. Blue is a dilution of the color black. The genetic make-up of a blue dog contains a recessive trait that causes the color pigmentation to clump around the middle of the hair shaft leaving the tips colorless. The effect to our eyes is the dusky gray that is commonly called blue. You may recall from your school days in science class that in order for a recessive trait (like blue eyes in humans) to be expressed in the offspring, both parents must carry the gene for the recessive trait. Add to that the fact that the alleles that interact with and influence coat and skin color and color patterns are found in several places along the canine genome, and you can appreciate how tricky producing a particular color can be. Bottom line. 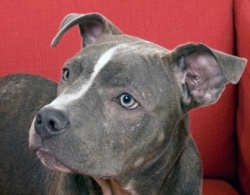 Breeders who "specialize" in blue pitbulls, in order to ensure the production of blue pups, must necessarily limit themselves to a relatively small gene pool. It's not uncommon for breeders to use dogs from the same families over and over in repeated breedings to bring the recessive traits to the fore. This practice, when overdone, is associated with both health and behavioral problems. What types of problems are caused by breeding for color? The most common health problems associated with blue coated dogs are skin diseases--ranging from hot spots to allopecia (baldness) to mange. While most of these conditions are treatable, they can be stubborn to resolve and the cumulative cost can be expensive. According to this article on the genetics of color found in The Encyclopedia of the American Pit Bull Terrier, the cells that create pigmentation interact closely with the neurological and immune systems. The article suggests that this may explain why dogs with recessive coloration seem more susceptible to nervous conditions and immune disorders. Consider, for example, the high incidences of deafness, low vision and temperament issues that are associated with white, merle and harlequin dogs. A number of breeders state prominently on their websites that blue pitbulls are known to be more susceptible to bacterial, viral and fungal infections and they will not guarantee their blue pitbull pups or those with blue parents against skin disorders. Does this mean I should avoid blue pitbulls altogether? I wouldn't advocate rejecting a dog because it's blue anymore than I would encourage acquiring a dog because it's blue. Just because a dog is more susceptible to certain problems doesn't mean those problems will develop in that particular dog. Dogs, like people are individuals and should be treated as such. So, if you find a nice dog that happens to be blue, go in with your eyes open. Be prepared to get the dog treated if necessary. But otherwise, enjoy your beautiful dog!